Minute Maid Park, previously known as The Ballpark at Union Station is a ballpark in Downtown Houston, Texas. The stadium opened in 2000 to house the MLB team, the Houston Astros. If you’re planning a trip to Minute Maid Park, let Sun Travel Trailways help you get there! We want your trip to be as stress-free as possible so you can focus on having a relaxing and fun-filled time. Request a quote for more information. 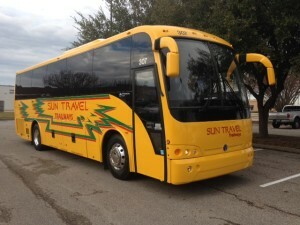 When travelling with Sun Travel you’ll be able to relax in one of our comfortable, secure charter buses after a long day of sightseeing. Book a group tour of the historic stadium. Host private special or team-building events at the ballpark. Enjoy shopping and dining all while watching the game at one of the ballpark’s shops or concession stands.